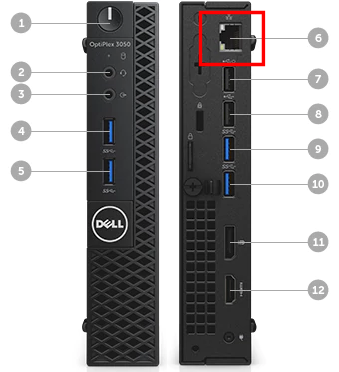 The instructions in this section assume that you have already connected the WAVE Gateway hardware. If you have not done so then see the How do I setup a WAVE Gateway topic. The instructions in this section also assume that you have already followed the Broadband Quick Start section to establish Customers, Users, and Talkgroups. If you have not done so then see the Quick Start – Broadband topic. TIP: If you are using a Capacity Plus system, see the Capacity Plus Radio System Parameters topic for tips on locating the required parameters. If you are integrating with a Capacity Plus Single-Site or Multi-Site Radio System, use the instructions below. IMPORTANT: This procedure is specific to Capacity Plus Single Site and Capacity Plus Multi-Site. If you are creating a Capacity Max Radio System, then refer to Step 2B. In the Customers page, click Radio System. The Radio System page opens. Initially the page will be blank. Click the large plus symbol in the white rectangle to add a radio system. The WAVE Gateway Wizard opens. In the Existing Gateway list, select an existing WAVE Gateway if you have one already installed on your network. In Device Code, enter the device code of your WAVE Gateway hardware. This is the code you used when you configured your WAVE Gateway. In Device Name, enter a name for your WAVE Gateway. This name is used for administrative purposes and does not appear outside the WAVE Portal. The Create Radio page opens. Leave Existing Radio as None if you intend to define a new Radio System. If you have previously created a Radio System and want to duplicate its settings then you can select an Existing Radio system. In the New Radio System Type menu, select the type of the new radio system. For this procedure it is assumed that you have selected either Capacity Single Site or Capacity Multi Site. In Name, enter a name for the new Radio System. The name you enter will only appear in the WAVE Portal and is used for administrative purposes. If you selected Capacity Plus Single-Site or Capacity Plus Multi-Site, then in Radio System Settings, complete the following steps. Enter the start range of Talk Group IDs to register with the Capacity Plus radio system. All specified IDs in the range will attempt to register with the radio system. WAVE will prevent you from creating Talk Groups outside this range. Enter the end range of Talk Group IDs to register with the Capacity Plus radio system. Enter the amount of dead air time in milliseconds required to terminate a Private Call. This value should match the Private Call Hang Timer specified in the Capacity Plus system. Each Private Call transmission between a radio and a Broadband Client resets this timer. Once the timer expires, the Private Call session is terminated. Enter the amount of dead air time in milliseconds required to terminate a Group Call. This value should match the Group Call Hang Timer specified in the Capacity Plus system. Each Group Call transmission between a radio and a Broadband Client resets this timer. Once the timer expires, the Group Call session is terminated. Enter the amount of dead air time in milliseconds of silence required to terminate an Emergency Call. (Note: WAVE does not currently support Emergency Calls, but the radio system requires this value). Enter the amount of dead air time in milliseconds of silence required to terminate a Private Call. Enter the maximum transmission time in milliseconds required to terminate a Group Call for WAVE clients only. When this timer is exceeded, the WAVE client ceases to transmit and the user will receive an error tone. Enter the Privacy Type as it appears in the Radio System. 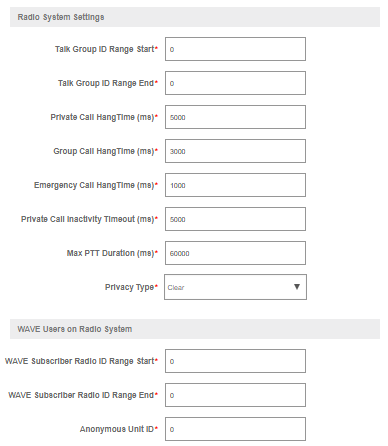 In WAVE Subscriber Radio ID Range Start, enter the starting range for your Broadband WAVE Users. In WAVE Subscriber Radio ID Range End, enter the ending range for your Broadband WAVE Users. In Anonymous Unit ID, enter an ID (from the range you just specified above) to represent anonymous Broadband WAVE Users that will not receive a specific unit ID. The Connect to Gateway page opens. Complete the following steps. Enter the Master Repeater IP Address of your Radio System. Enter the Master Repeater UDP Port of your Radio System. 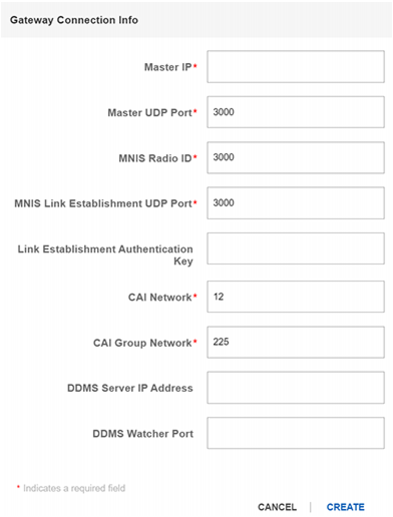 Enter an MNIS Radio ID to identify the WAVE Gateway to the Radio System. This should be a unique ID that does not occur in the Radio System or any other connected CAI devices. 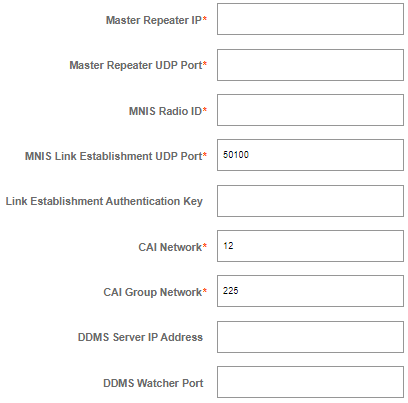 In the MNIS Link Establishment UDP Port field, enter the UDP port that serves as the gateway to the LE (Link Establishment) domain. The WAVE Gateway uses this port to send and receive audio and keepalive messages with the Radio System. Enter the Authentication Key for Link Establishment. Enter the CAI Network value from the Radio System. In the DDMS Server IP Address field, enter the IP address of the Radio System presence notifier. This is only required if NAI Data is enabled on the Radio System. If your Radio System does not use NAI Data, then enter 127.0.0.1 for the IP address. In the DDMS Watcher Port field, enter the receiving network port for the Capacity Plus Presence Notifier. This is only required if NAI data is enabled on your Capacity Plus Radio System. If your Capacity Plus Radio System does not use NAI data then leave this field blank. The CONFIGURE TALKGROUPS page opens. Optionally, select existing Talkgroups to associate with this Radio System or create new Talkgroups to associate with this Radio System. The CONFIGURE USERS page opens. Optionally, select existing Users to associate with this Radio System or create new Users to associate with this Radio System.Users you select or create on this page will be associated with the Radio System. You will be asked to provide them with a Unit ID. The FINISH page opens and your Radio System is ready for management. Click the GO TO HOME DASHBOARD button. If you are integrating with a Capacity Max Radio System, use the instructions below. IMPORTANT: This procedure is specific to Capacity Max Radio Systems. If you are creating a Capacity Plus Single Site or Plus Multi-Site Radio System, then refer to Step 2A. Use an Ethernet cable to connect the WAVE Gateway to Switch Port 21. Ensure this switch provides Internet Access. The WAVE Gateway requires Internet access to connect with the WAVE system. 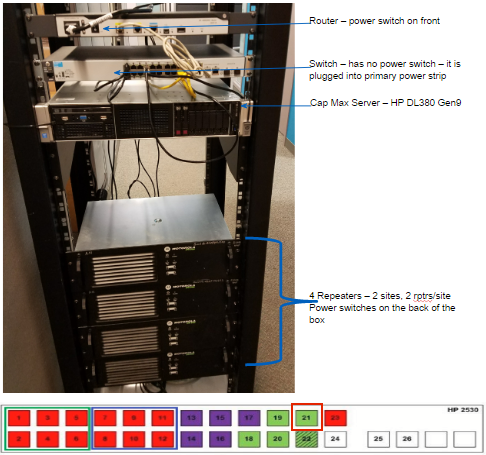 Alternatively, you can place a secondary switch between Capacity Max and the WAVE Gateway and connect the secondary switch to the Internet. Enter the amount of dead air time in milliseconds required to terminate a Private Call. This value should match the Private Call Hang Timer specified in the radio system. Each Private Call transmission between a radio and a broadband client resets this timer. Once the timer expires, the Private Call session is terminated. 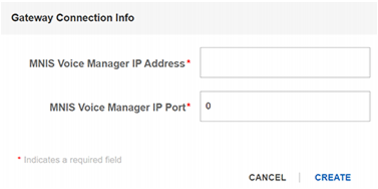 In the WAVE System ID field, enter the Network ID from the Capacity Max interface. In the WAVE Users on Radio System section, enter an Anonymous Unit ID. In the Capacity Max radio system interface, you must create a ‘Device’ for the Anonymous Unit. Enter the Device ID from the Capacity Max interface into the Anonymous Unit ID field in the WAVE Portal. Enter the IP Address for the MNIS Voice Manager. In Capacity Max this is the VCR Gateway IP. Enter the Port number for the MNIS Voice Manager. In Capacity Max this is the Server TCP Port. In the Capacity Max system, you must create a new Device for each Subscriber in the WAVE System. User the Device ID for each Device to enter the Unit ID for each WAVE Subscriber that will be capable of making Private Calls with Capacity Max Radio Units. On the right side of the screen, click the Create a new Gateway button (the ‘+’ symbol). The Gateway Configuration screen opens. In Device Code, enter the device code you recorded when you configured your WAVE Gateway hardware. In Device Name, enter a name for the Gateway. This name is for administrative purposes and does not appear outside WAVE. The newly created Gateway appears under the Gateways section on the right side of the page. 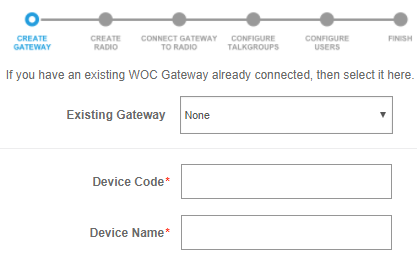 In a Radio System box, click Associate a Gateway. The Gateway Connection Info box appears. The Gateway Connection Info box will differ depending on the radio system you selected. If you selected Capacity Max as your radio system then complete the following information. If you selected a different radio system, then skip to 3 in this procedure. In MNIS Voice Manager IP Address, enter the IP Address for the MNIS Voice Manager. In MNIS Voice Manager IP Port, enter the port for the MNIS Voice Manager. Go to 4 in this procedure. If you selected Capacity Plus Single-Site or Capacity Plus Multi-Site, then complete the following information. If you selected a different radio system then go to 4 in this procedure. Enter the Master IP address of your radio system. Enter the Master UDP Port of your radio system. Enter the CAI Group Network value from the radio system. In the DDMS Watch Port field, enter the receiving network port for the LCP/Cap Plus presence notifier. This is only required if NAI Data is enabled on the radio system. If your LCP/Cap Plus system does not use NAI Data, then leave this field blank. Click the Associate a Gateway box. In the Select a gateway list, select a Gateway from those you created earlier in Step 3: Create a WAVE Gateway. Click the green check button. The selected Gateway is now associated with the Radio System. Hover over the radio system to add Subscriber to and then click the green check mark to edit the radio system. The editing page opens for the selected radio system. At the bottom of the page click Subscribers List. The Subscribers list opens for the selected radio system. In the NAME field, enter the Alias for the Radio Subscriber. This name will appear to Broadband Users when the radio with this UNIT ID transmits. In the UNIT ID field, enter the ID of the radio unit as it appears in the radio system. IMPORTANT: In the Capacity Max radio system interface, you must create a Console Device for the each WAVE Radio Subscriber. The Device ID must match the UNIT ID of the Subscriber. Click the green check box to finalize the entry. Talkgroups are Broadband-only by default. You can associate any current Talkgroup with any existing Radio System or you can create a new Talkgroup. All transmissions on a Talkgroup associated with a radio system will be shared between Broadband Users on the radio system and radio users on the associated Talkgroup. Mouse-over a Talkgroup to associate with a radio system and click the Edit icon. The radio system editing page opens. In the Radio System list, select the Radio System to associate with this Talkgroup. The page expands to display additional fields. Enter the following information. In Talkgroup ID, enter the ID of the Talkgroup as it appears in the Radio System. In Site, select the Site for the Talkgroup or Wide if the Talkgroup should transmit across Sites. The Sites selection will not appear if the radio system does not support Sites. In Privacy Key, select a Privacy Key for the radio system if you have created one. If the site unencrypted then leave the setting Clear. If you require a Privacy Key, then click Manage Privacy Keys, click Add Key, and enter the values for your Privacy Key. If you are using Basic as your Privacy Type then enter the Privacy Key Index value from the Radio System. Ensure you have Broadband Users signed-in to WAVE using a Broadband client. Test their transmission first to ensure it is working correctly. For instructions see Quick Start – Broadband. Using two radios on the same Talkgroup, transmit over the radio. The audio from the transmission should come across the other radio and the Broadband clients. Transmit over the Broadband clients to ensure their audio is being transmitted to the radios.